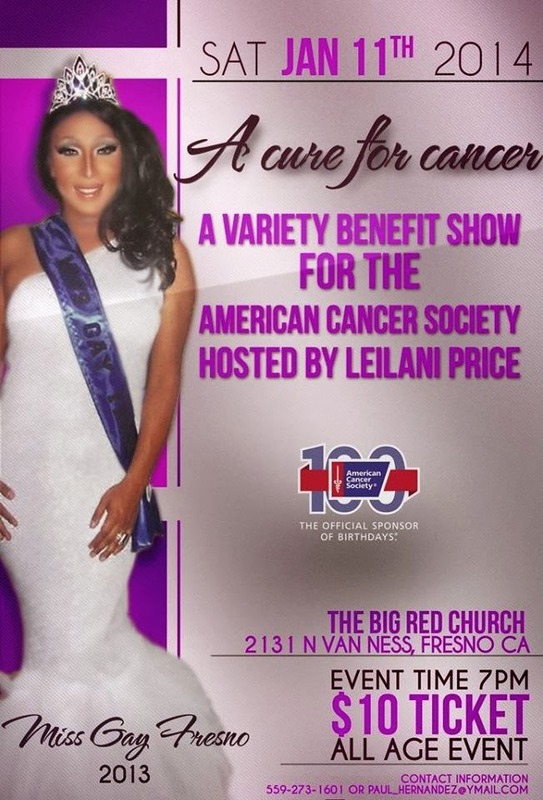 Leilani Price has partnered with the American Cancer Society and The Big Red Church of Fresno for a benefit show in which ALL PROCEEDS will go to this great organization. Thank you everyone and I hope that this community can pull together for a great cause! As 2014 kicks off, Gay Central Valley is thrilled to announce the first of many fundraisers to raise funds to open an LGBT Community Center in Merced. Gay Central Valley's goal since it's inception has been to open LGBT Community Centers throughout the Central Valley of California. Currently, the Fresno LGBT Community Center is the only such Center between Bakersfield and Sacramento. 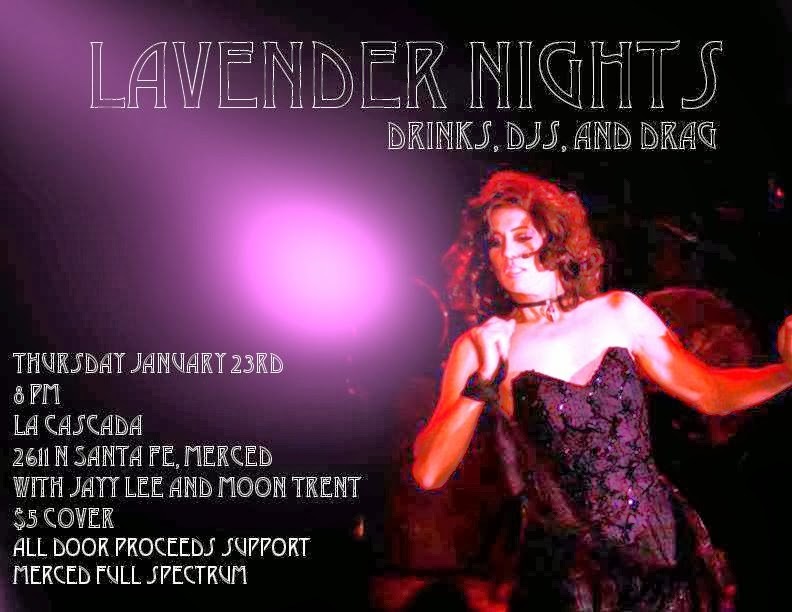 On Thursday, January 23rd, we'll host our first fundraiser, a Drag Show and Dance Night at La Cascada in Merced. We are looking for Fresno Drag Queen and King perfomers to entertain the crowd and other who are willing to participate. Check out the flier below for details and if you'd like to help out with entertaining please email Gay Central Valley President Chris Jarvis at chris@gaycentralvalley.org or call the Fresno LGBT Community Center at 559-325-4429. If you'd like to attend, we urge you to come to this groundbreaking event in Merced. Imagine another LGBT Community Center in the city of Merced! All donations to the event are tax deductible, as Gay Central Valley is an official 501c3 nonprofit organization. http://www.lgbtmerced.org/ to make a direct donation. Join us as the NTC family comes together to bring you the BEST SHOW you've seen all year!!! The Lotus Queens, No Town Royalty, The very lovely Patricia de Leon of Seductive Wednesdays, and Fresbians Kings will join forces to close out the year the right way!!! Join us as we celebrate the year and our NTC family. We realize that the best part of our family is the CROWD that is why we are also doing our best to give back to you ALL!!! We will be raffling away some AMAZING prizes including an Android Tablet. Here's the BEST part!!! RAFFLE tickets are FREE!!! For everyone who joins us for our Winter Bash you will receive one raffle ticket, you can get MORE tickets by buying drinks from our lovely NTC Bartenders. For every drink you purchase at the bar you will get one ADDITIONAL raffle ticket. So come out, grab a cab, and enjoy a night with some of the Valley's BEST PERFORMERS!! !